This morning it was clear and cold. I considered walking to the beach for my daily exercise but saw that the mountains were clouded in. So after I got my coffee, I walked to Fauntleroy Park. My neighborhood is relatively quiet for an urban area but the street that runs along the park boundary gets a fair bit of traffic. There’s a burst of street noise as I cross it and follow the path into the woods. 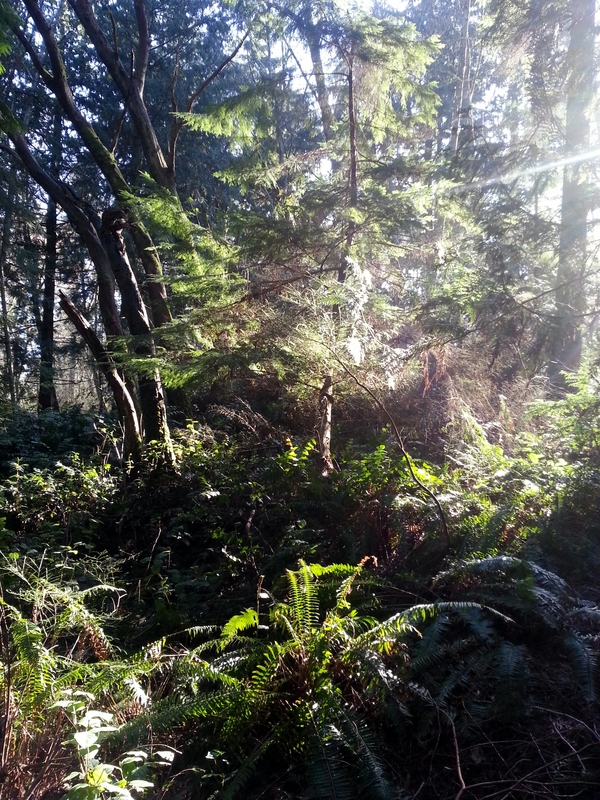 The first thing I notice is the myriad of greens in the trees, the ferns, the mosses, and the woodland plants. Then I start hearing song birds and crows. The street noises fade as I walk further into the interior until all I can hear is the sounds of the forest and of my own footsteps on the trail. This morning there was mist rising from the ferns. I could see my breath. I looked at the mist as it rose upwards, felt my breathing slow, and noticed that I was smiling, as I often do when I am surrounded by nature. I felt immediately transported, like ice to steam, and that my spirit was rising above the nests in the trees and above the canopy. I stayed in that blissful state as I walked along. Then I looked down and noticed something. I was off the trail. I had meandered with my eyes on the trees and the new plants growing and had not noticed that I’d lost the trail. I knew that if I walked down hill, I’d eventually find the trail. But it did make me reflect on the way that we live in multiple worlds and both worlds are necessary. I think this is one of the reasons I don’t like a lot of pithy inspirational sayings. They seem dreamy and overly ethereal. There’s not enough reality to provide ballast. And I also think that it may be one of the reasons that a number of people with cancer do not like to be referred to using idealistic terms like “hero”, “inspirational” or “brave”. Those terms live up in the Heavens. Cancer is isolating and I know for myself, I want to be very much seen as a real human being. I want to be able to connect with other people. Then there are the attitudes that are all ballast. Those are the stigmatizing attitudes, the view of cancer as a death sentence, the fears that keep our friends away from us because they fear our death as well as their own. What matters to me more right now than if I am brave, inspirational, or a hero, is that I am still carrying the sounds, sights, and smells of the forest in my heart as I go about my daily chores and consider life’s obstacles and joys in the past, the present and the future. 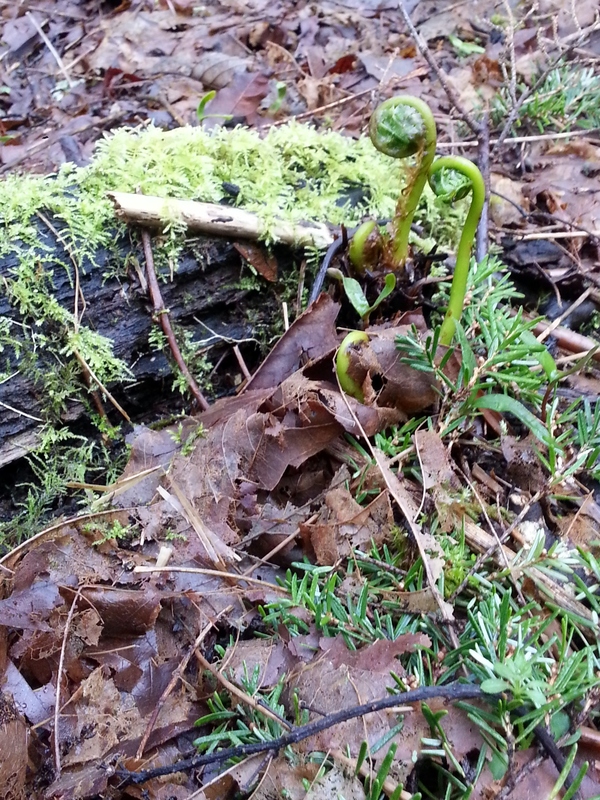 The fiddlehead ferns are unfurling. They are edible at this stage. Thank you, Elizabeth. This is a great post. xoxoxo. I was writing it in my head on my walk today and then the conversation we had today added a whole new layer to what I’d been thinking about. So thank YOU. Great post, Liz. 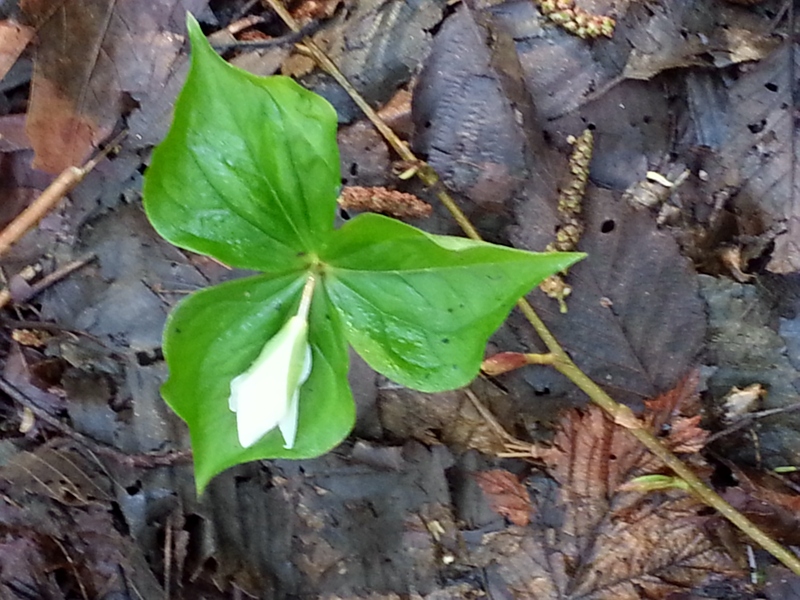 I checked my trilliums last week, not yet. Ferns are abundant . Our woods look like a rain forest right now. So fortunate to be able to enjoy the sights and sounds of nature. I heard at least one owl last night. It hooted for several hours. I listened as I said a prayer of thanksgiving. Mom, that sounds really wonderful. Catherine, that’s really lovely. I did not know about the koru. I’m glad you enjoyed the photo. Thanks so much, Karen. The camera on my smartphone gets a lot of use! I hope you are well. xoxo. Yes, Helen we get just enough season change to see the changes. Each time I read this, I realize what a great person we have for a daughter. Thanks so much, Diane. I’m so glad you got something out of this post. I got a lot out of writing it.